On August 4, 2012, pirates attacked an oil barge, killing two local security personnel and kidnapping four foreign workers. Two weeks later, pirates hijacked and held for five days a British-managed oil tanker as they unloaded its cargo, a style of attack that repeated the following fortnight on a much larger Greek owned tanker. While such events were routine of late off the coast of Somalia, these attacks occurred on the other side of the continent, in the West African territorial waters of Nigeria and Togo. Piracy has now declined in the Indian Ocean—a trend attributed to international naval patrols, the increased use of armed guards aboard ships, and political developments in Somalia—but in the Gulf of Guinea it is on the rise. The region reported 47 incidents of piracy (it is estimated that up to 60% of attacks go unreported) to the International Maritime Organization (IMO) in 2010, a number which rose to 61 in 2011 and will likely be surpassed by 2012 figures. Highlighting this growing danger, Lloyd’s Market Association, a London-based group of insurer representatives, recently added the Gulf of Guinea to its “Hull War, Strikes, Terrorism and Related Perils Listed Areas,” placing the waters of Nigeria and Benin in the same category as those of Somalia and Iraq. Seeking to examine the intricacies of this oft-overlooked security threat, this article intends to do three things in three posts: chart the evolution of West African piracy, assess whether or not a “Somalization” is occurring, and evaluate regional and international plans to combat the mounting crisis. 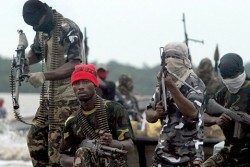 MEND Pirates/Militants. Likes: Walks along the beach; oil. The problem of piracy in the Gulf of Guinea extends from Senegal in the north to Angola in the south, and affects over a dozen countries in between. The historical epicenter is Nigeria, where pirates have parasitically fed off the country’s oil boom since the 1970s. During Nigeria’s first iteration of piracy, the crime began as simple economic opportunism. Ransacking docked ships was common, while bolder pirates—equipped with little more than canoes and machetes—ventured slightly further from port in attempts to board and rob slow-moving vessels. The theft of crude oil from refueling or anchored ships, referred to as “bunkering,” also brought a tidy profit through resale on a black market that spans the continent. In the early 2000s, a drastic change occurred as piracy, while remaining an economic-minded crime, became infused with politics. The basic grievance was that the federal government in Abuja had taken too great a share of Nigeria’s petroleum wealth, while distributing little back to the oil-soaked communities of the Niger Delta. A plethora of militant groups emerged to “reddress” the oil issue during this period, the most significant of which was the Movement for the Emancipation of the Niger Delta (MEND). Piracy expert Martin Murphy concludes that in West Africa, the “line between the political and the criminal is hard to draw.”3 In Somalia, pioneering pirates first made claims of “restitution” for illegal foreign fishing and toxic dumping before expanding into indiscriminate hijacking and hostage taking, driven solely by profits. Similarly in the Gulf of Guinea, bunkering began as a form of economic protest but has grown into a multi-million dollar industry as oil tankers’ valuable cargos are robbed and resold. Attacks off the coast of Nigeria have ebbed and flowed in recent years. Intensified naval patrols and a 2009 government amnesty offered to Delta militants resulted in a decline in reported attacks – from a high of 42 in 2007 to 10 in 2011.4 Nigerian piracy has increased in 2012, however, with 23 incidents already reported in the first three quarters. According to piracy expert J. Peter Pham, the gangs now operating across the Gulf of Guinea are “composed mainly of, and certainly led by, Nigerians, with perhaps a smattering of other nationalities.” They have shifted their operations into neighbouring states as the authorities there lack the capacity to survey and patrol their own waters. Piracy is but one symptom of the lack of maritime order in the region, as endemic drug smuggling; human and weapons trafficking; and attacks against oil infrastructure have threatened to turn West Africa’s seaways into a criminal super-highway. These manifestations of maritime insecurity are linked, speculates Bronwyn Bruton, as international criminal syndicates previously involved in weapons and drug trafficking “[jump] on the pirate ship” as a new source of revenue. 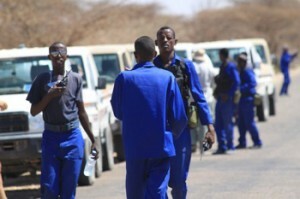 This claim was reiterated by Abdel Fatua Musah, Director of Political Affairs for the 15-member Economic Community of West African States (ECOWAS), who reported to the UN Security Council that piracy has dovetailed into other forms of transnational organized crime. 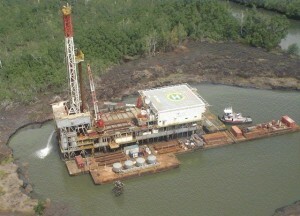 Piracy and theft are believed to cost Nigeria 7% of its annual oil revenues. Benin’s port of Cotonou—taxes from which account for 40% of the country’s GDP—is witnessing a reported 70% decline in shipping activity due to piracy.5 In total, it is estimated that piracy costs the littoral states of the Gulf of Guinea an annual $2 billion in stolen cargo, rising insurance premiums, and other security costs. As the menace expands, the export of metals, cocoa, and agriculture products—vital to both local development and world markets—will also come under threat. James Bridger is a Maritime Security Consultant and piracy specialist at Delex Systems Inc. He can be reached at jbridger@delex.com. This article is a modified form of James’ work with the Atlantic Council of Canada’s Maritime Nation Program publication “From Sea to Sea: The Search for Maritime Security“. 4. International Maritime Bureau, “Piracy and Armed Robbery Against Ships: Report for 2011,” International Chamber of Commerce, January 2012. 5. “An Emerging Threat? Piracy in the Gulf of Guinea”.